If you’ve ever painstakingly applied eyeliner to your lower eyelid only to end up looking like a raccoon after a few hours, don’t fret—you’re not alone. Sometimes it seems nearly impossible to keep eyeliner from smudging on the bottom. There’s a thin line between “cute, smudged, smoky eye look” and “trash panda,” and it's a tightrope. It is possible to keep your eyeliner in place, even on your bottom lid, using a few special tricks. According to professional makeup artists, these tricks will prevent your eyeliner from smudging, migrating south, or disappearing altogether. As a result, you can create pretty much any lower lid eyeliner look you can think of, whether it’s a smoky look or a pop of cerulean blue. First things first: Make sure you're using the right product. 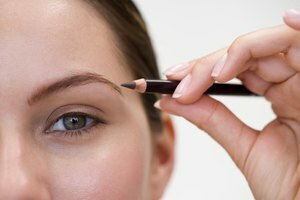 Certain eyeliners are much more likely to smudge under your eyes than others. For example, liquid eyeliner smudges super easily on the lower lid, so skip it. Instead, opt for a pencil eyeliner, Patrick Ta tells Cosmopolitan. For the more advanced, gel eyeliner is another option, though it requires “more blending and a softer application,” makeup artist Lisa Gibson tells StyleCaster. Use waterproof eyeliner only on the lower lash line, Ta says. Even if you intend to line only your actual skin rather than your waterline, a waterproof formula is less likely to budge over time. His favorite is the Urban Decay 24/7 Glide-On Pencil, $21. A pencil eyeliner that won’t smudge has to be just creamy enough, and it has to pack a strong punch. Rowe recommends a simple test for your next eyeliner: draw a line on your hand, wait a couple seconds, and then smudge it to see if it fades. If it does? Put it back on the shelf. She likes the Stila Smudge Stick Waterproof Eye Liner, $22. Once you’ve found your Cinderella eyeliner—the perfect fit—it’s time to prepare your lids. Smudged makeup is usually the result of oiliness, so it’s best to start with a clean, dry face before applying any eyeliner. If you wear foundation or concealer, apply that before the eyeliner, so that your eyeliner has something to cling to, says Gibson. And, every one of these experts recommends another crucial, final step: translucent powder. Apply a powder like the Laura Mercier Translucent Loose Setting Powder, $38, underneath your lower eyelid to prevent the color from traveling south. Armed with makeup tips from the pros and a little practice in front of the mirror, you’ll never have the smudged raccoon look again. Byrdie: Ask a Makeup Artist: How Can I Get My Waterline Eyeliner to Stay On?